It's Tuesday already!!!! WOW...Time is flying and May is just a few days away. I really love the look of white on white and then when you add another color you can make it fit for any personal/favorite occasion. So as you can see, my plus one is red. I used quiet a few Cheery Lynn Designs product on my card today. I embossed a strip of textured cardstock with the CDL Wood Grain Embossing plate and matted it back onto the white textured carstock. The rolled flowers were cut from vellum and the textured cardstock using Memory Box Pinwheel Posie and I applied Stardust glitter glue, which is my FAVORITE!! I then cut Fanciful Flourishes, Heart to Heart and Mini Pearl French Flair from the same cardstock. 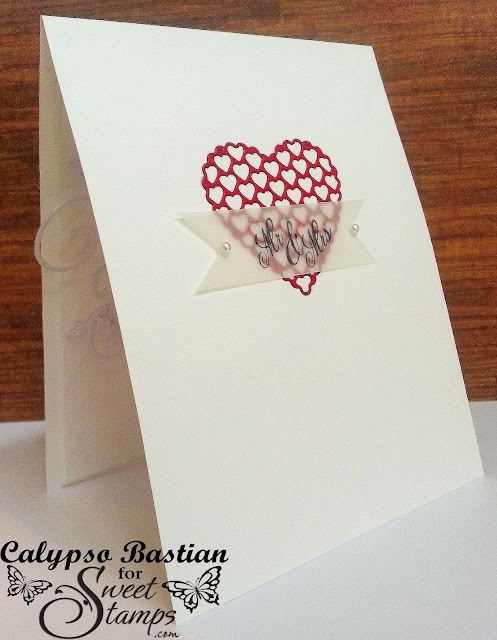 This is the inside of my card using Mr and Mrs stamp, by SweetStamps. I stamped the image on vellum/parchment paper. Added a couple of pearls to finish off the inside. Stunning card!! So beautiful!! Lovely job! Wow so elegant. 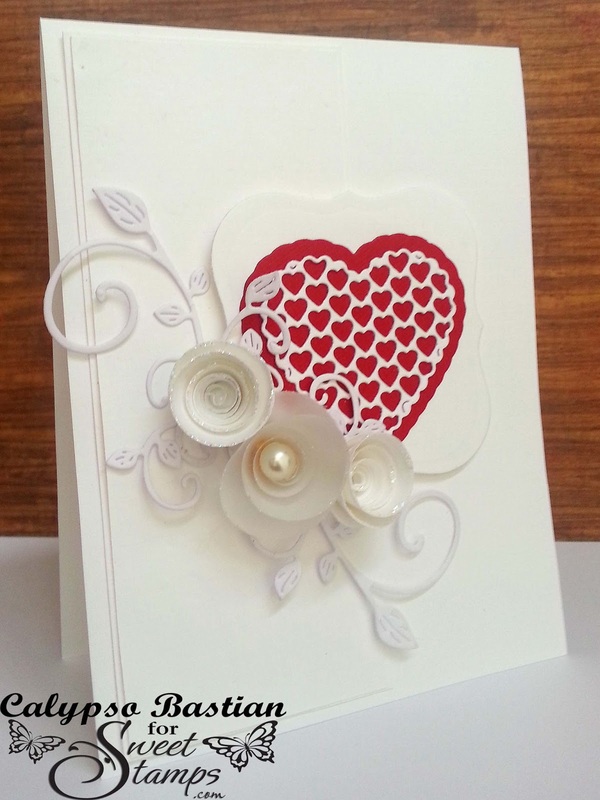 I love the flourishes and vellum flowers with the sparkle, the red heart really adds a pop of color. Gorgeous!! Very pretty, Calypso. I love white on white cards as well and yours is a beauty. Lovely combination of dies. Good luck in the Bling It Up challenge at Cheery Lynn Designs. Cute card! Love all the sweet details. Thanks for joining us this week at Try Stampin' On Tuesday. White on white cards are one of my most favorite cards and when they are done right they are stunning. Your card is perfect and one on the nicest ones I have seen in a long time. Thank you very much for joining us this week at Cheery Lynn Designs. Wow! This is such a beautiful elegant card. I love the flowers and the pop of red. Love this. Your roses are beautiful. Thanks for sharing and playing with us this week at TSOT.